This one’s a quickie – a present for Denizen (one of Younger Daughter’s pals, currently staying with us). She’s also headed off to university next year, and deserves her own bit of stitched wall art with a favorite saying. As you can see, I’ve already laid in the saying itself, using yet another of the alphabets from Ramzi’s Patternmakercharts.blogspot.com website. In this case, I’ve chosen a very simple all lower case set from Sajou #104. A fancy font would be too bombastic for this sentiment. I used plain old cross stitch (POCS) for the letters. Ground this time is a large-as-logs 30 count even-weave linen remnant from my stash, long since disassociated from any label, vintage, or maker identification. The floss is more of my India-purchased faux silk – deep crimson, bright green, strident blue, and daffodil yellow. Patterns (so far) are all from The Second Carolingian Modelbook. Being unbound by any historical or usage constraints on this one, I’m happily playing with colors, limited only by the availability of my remaining threads. I’d like to use far more red to anchor the piece, but it’s the color of which I have the least, so I have to work it in more sparingly. I’m also changing up the orientation and proportions of this one. Instead of long and thin like historical samplers, or portrait orientation like a standard reading page pieces I’ve stitched lately, I’m doing this one landscape – with the longer dimension east-to-west rather than north-to-south. 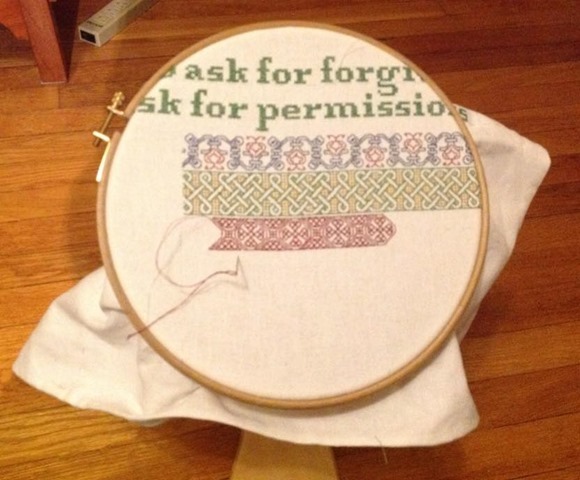 I’ll probably run a more solid border the full width top and bottom, either POCS or long-armed cross stitch. There will be two banks of geometric bands, left and right both above and below the centered saying. Although I might mix that up with a collection of spot motifs above the saying. I haven’t decided yet. One failure of note though. I wanted to do some Swedish Weaving stitch on this one, as a nod to the Denizen’s heritage. While that style is usually done on huck towling, it can also be done on plain tabby weave fabrics. Unfortunately, this particular ground cloth and my ultra-fine floss are a bad combo for the technique. I didn’t like the look so I picked it out and went with what I have. I’ll do a Swedish Weave project another time. The motto took just one weekend, and at red bit is only one night’s stitching – about 2 hours worth, so I forecast that I’ll rip through this project in no time. Working over one? It looks great! Thanks! I’m doing the quick and easy thing, working over 2×2. Speedy!